Click here for Anne Kerkian's blog entry about her experience as an intern this year! 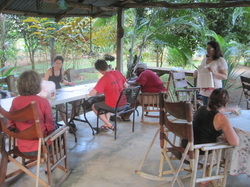 Our internship at Centro Espiral Mana was challenging and rewarding. As interns we had an incredible range of experiences. Not only did we get practical classroom teaching experience, but we also were able to take courses on Compassionate Communication and Teacher Training. Every minute of the internship was packed with learning and I learned a lot about learning. One of my most significant take aways from my experience is how I see learning. Through my observation and feedback sessions, Mary and Emma helped me to examine the notion that what I think I am teaching may be different from what my students are learning. My job as a teacher is to not only know what my students are learning, but also to know how I know, what they know. For many this may be self evident, but for me it wasn't. The process that we went through in feedback and reflection helped me to see that this area in my teaching needed work. With this awareness I am now better able to conceptualize assessment of learning in the classroom. I found the internship to be a tremendous learning and growing experience. Vigorous assignments - they will make you think! I completed the School for International Training (SIT) MAT TESOL Internship at Centro Espiral Mana during the winter of 2012. Centro Espiral Mana is a rustic retreat in the rural farming village of El INVU de Penas Blancas. Tropical birds can be heard chirping throughout the day and even the occasional sloth can be found amongst the treetops on the grounds. There are fresh watering holes in walking distance for swimming on those muggy Costa Rican days and an amazing picturesque view of the inactive Arenal Volcano can be seen from the Centro’s backyard. The Centro’s location is idyllic; however, what happens at Centro Espiral Mana is even more spectacular! Mary and her team work meticulously to provide an internship experience that encourages experiential learning, reflective practice, compassion and empathy & training and development. They are constantly challenging their interns and course participants to go the extra step and walk the mile in the shoes of the learners. Before interning at Centro Espiral Mana I struggled with giving clear instructions. Mary and her co-trainer, Emma Torres shared their own personal insights, strategies and techniques with me and because of what they shared I am now able to give clear, concise and consistent instructions. My recommendation to any intern considering Centro Espiral Mana would be this: Be prepared to work hard, be prepared to challenge yourself and most importantly be prepared to grow! I had several choices of places to go for my internship - Rabat, Morocco, a refugee camp in Thailand, urban and rural locations in South Africa - but I found Centro Espiral Mana in Costa Rica was really the best choice for me. The trainings and coaching were rigorous, supportive, and prepared me to go out into my internship to practice what I had been learning. At my request, I was placed with a family in Ciudad Quesada - a small city up in the mountains, surrounded with vegetation. I taught at a private conversation school for teens and adults just a short bus-ride down the hill, so I had the bulk of my days to plan lessons and explore the area. During my internship I learned the value of reflection. With Mary's guidance, I began to develop more curiosity and analytical skills. These have enabled me to more clearly see what in my teaching is working or not, and to come up with ideas to make things work better. I'm no longer teaching English, but I'm still teaching (a course on teaching!) 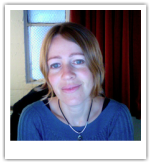 and I have moved into teacher training and support as a Faculty Developer at a major art and design university in San Francisco. Apart from the work, some of my fondest memories from my time at Mary's are sightings of a sloth in a tree, meals together with the internship participants, looking for the ever-illusive Arenal volcano to appear from behind the clouds, lazing in the river, wandering around the village and chatting with the locals. 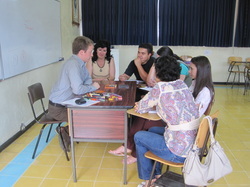 The internship at Centro Espiral Mana was challenging, even difficult at times, but ultimately very rewarding. We took two courses while we were there - Compassionate Communication and Skills and Principles of Language Teacher Training - and we also taught intensive English classes. For me, the best part was the course on teacher training. It is a topic that is very interesting to me and I learned so much. I ended up presenting my workshop five times to over 125 local English teachers. That was an amazing experience, interacting and connecting with local teachers. We all worked very hard during the internship, but we had some time to have fun also. We got to relax in hot springs, go to the beach, and take many long walks in the beautiful Costa Rican country side. Mary and Emma were great supervisors. I learned so much from them and I know I'm a better teacher for it. All in all, I recommend this internship, but be ready to roll back your sleeves and do some hard work!